The premise of bodybuilding is, essentially, “building your body,” or tearing the muscle fibers so that they can reform into bigger, more exaggerated muscles. Recovery from this hard style of training is paramount for significant amounts of muscular growth, but even if you’re eating according to your goals, warming up before a workout and stretching afterward, and getting enough sleep, your muscles still may not be receiving the proper amount of recovery they need. This lack of recovery can actually hinder your progress — and really, who wants to train sore muscles anyway. In comes branched chain amino acids, or BCAA. Branched-chain amino acids are the three essential amino acids leucine, isoleucine, and valine that are found in animal proteins, and are readily used during ATP energy production (especially during periods of high intensity, such as weight training). These three amino acids are categorized as “essential” amino acids because the body cannot make them itself and instead requires them through food intake. Branched chain amino acids can be used for both muscle recovery post-workout and for muscle conservation and increased energy production during a workout. Both processes are essential for full muscular growth and repair. As I mentioned earlier, BCAAs aid in ATP energy production. This influx of free branched chain amino acids can be broken down even further into glucose (through gluconeogenesis), pyruvate, which aids in other ATP energy cycles, or other intermediates that the muscles can use for sustained energy. And because these free BCAAs do not first need to be broken down, they can supply your hungry muscles more quickly than an intra-workout carbohydrate or protein fix. In fact, an influx of BCAAs to the muscles during a workout can actually increase the number of available carbohydrates because of their conversion to glucose, which can help to prevent the decay of muscle tissue for energy. So yes, branched chain amino acids are essential for energy during exercise. But what about for muscle recovery? What can branched-chain amino acids do then? For post-exercise, the same principles apply. Firstly, BCAA supplementation can help to speed up the process of muscle recovery because of the influx of free essential amino acids. Because these amino acids do not first need to be broken down from food, which can take the body hours depending on both the quantity of proteins and what else was eaten — typically, the body breaks down foods in order of fats, proteins, and then carbohydrates, so the BCAAs would take a while to reach the muscles — they can quickly be shuttled off to the muscles that are trying to repair themselves after an exceptionally grueling workout. This is why your muscles feel particularly sore after training, but let up after about a day or so: they have the help of branched-chain amino acids in their recovery! In addition, the body needs to quickly refill its glycogen stores and cannot do so without a quick fix of carbohydrates — many sports athletes will supplement with white carbohydrates, such as cereals and rice. BCAAs work just as well, if not better, especially over a long period of time, because of the amino acids’ ability to be converted into glucose when needed or to remain as proteins to aid the muscles in their fight to recovery. 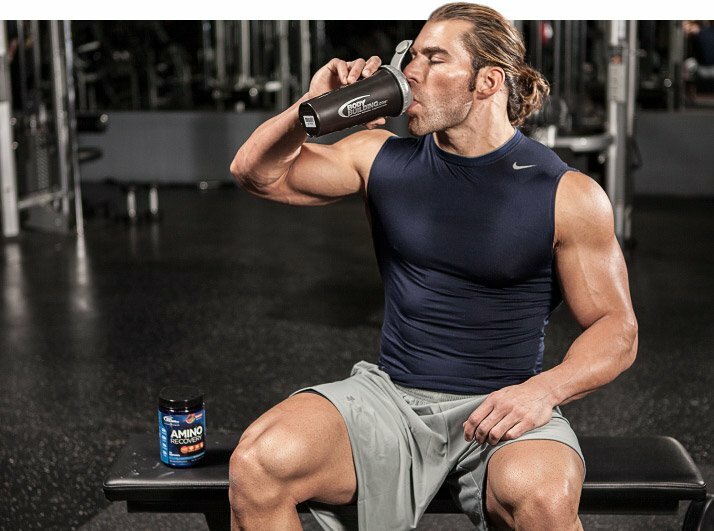 Increased plasma levels of creatine itself. to repair itself in the immediate days post-workout. Branched-chain amino acids are one of the more paramount supplements that can aid in muscle recovery — and, as a double feature, also aids in improving muscle function during exercise. Not only can BCAAs increase the amount of glucose supplied to the muscle during a workout, but they can also be used to decrease onset muscle soreness, decrease muscular fatigue, and prevent muscular damage (Larsen, 2016)! BCAAs can be found at most sports supplement stores in a variety of flavors (including flavorless, if that’s your style). The only essential element when purchasing a BCAA supplement is that they contain ample amounts of all three essential amino acids: leucine, isoleucine, and valine. Without a hefty amount of each, the supplement cannot do much in terms of muscle recovery. But with all three, it’s a force to be reckoned with.